Abstract: The ML1440 spits out black and white printing at 600x600 dpi, and at a rate of 15 pages per minute. After a few months of using an inkjet printer you'll begin to realize just how expensive those refill cartridges become. Sure the printer may be inexpensive, but add on ink cartridges for a year and things add up quickly. While colour inkjet printers are still far less expensive than colour laser printers, when it comes to black and white, laser printers have it made. A 15 page per minute laser printer like the Samsung ML-1440 retails for about $400CDN, with toner usually running about $60-80 a cartridge. The printer comes with a starter cartridge good for about 2000 sheets so you won't have to pick up your first replacement for a month, or several months depending on the amount of printing you do. The ML-1440 is a pseudo SOHO printer, and while it has the boxy shape, and paper tray underfoot, it is more like a home printer than true SOHO. Given that the majority of its components are constructed from plastic, the printer is best suited to small work groups or individuals. Durability is something which immediately drew concerns from us as the fold down manual paper trays were based on plastic components, not metal. One dropped ream of paper on the open tray could easily snap one of the supports for the envelop tray for example. Baring such potentially disastrous accidents, the ML-1440 has a slew of features to grab the attention of someone looking for a more office-like printer on a budget. 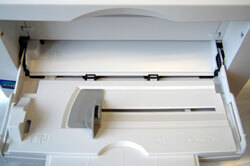 The ML1440 spits out black and white printing at 600x600 dpi, and at a rate of 15 pages per minute. Toner cartridges are rated at 6000 pages for 5% coverage. The ML-1440 uses a 66 MHz RISC processor with 8 MB of fixed memory. For the type of work this printer will be seeing, the 8MB buffer should be sufficient. 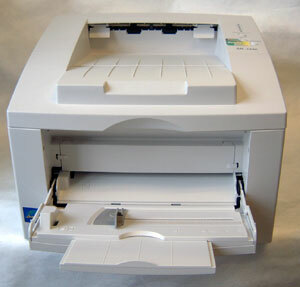 The ML-1440 is a medium-sized printer with a footprint on the desk of 35cm x 39.5cm x 24cm. It uses standard 120V AC weighs approx. 11 kg (24.3 lbs). From power off it takes about 40 seconds to warm up and be ready for printing. The ML-1440 can be attached to the computer via parallel port or USB 1.1 port, however, neither cables are included in the package which is somewhat disappointing.